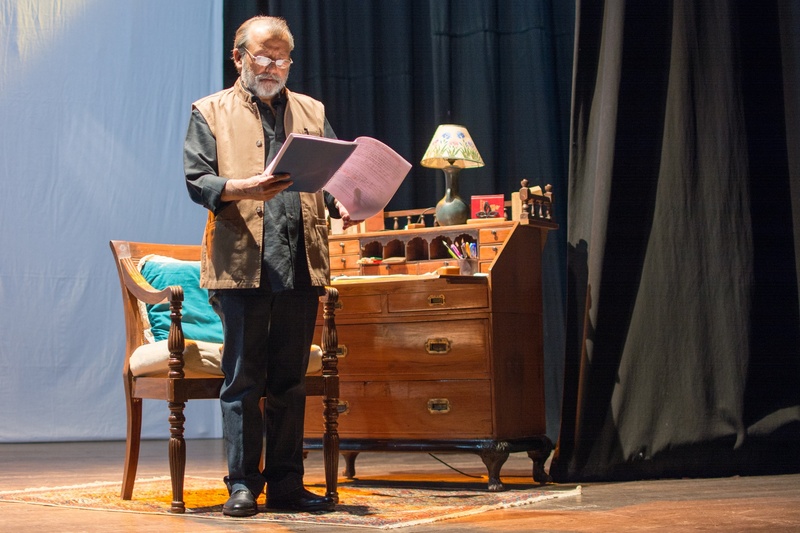 Pankaj Kapur, with some of his best performances through the years on stage and in films behind his back, is all set to perform on Dubai stage with 'Dopehri', a dramatic reading of the novella by the same name, written by him two decades ago. Dopehri has already received rave reviews in India and with it Kapur proves his excellence yet again, not just as an actor, but also as a story teller. The play revolves around the story of an old and lonely woman, Amma Bi and her journey from loneliness to self-discovery, in a haveli somewhere in the old streets of Nawabi city of Lucknow. The actor brings to us her story, in his words, stringing us through the emotions and nuances of the characters and the milieu of an old Lucknow. Dimple Mitra of ADSS, who is bringing Kapur to Dubai says, "In our endeavor to continue to bring quality and entertaining theatre shows to Dubai, we now present to the discerning audience of Dubai, the ‘International Premier of Dopehri’, the first live dramatic performance and rendering by the acting legend Pankaj Kapur. After being hugely successful in Bollywood movies, Mr. Pankaj Kapur has now focused his attention to writing and stage acting, Dopehri is the result of his literary and creative genius. "A National School of Drama graduate, Pankaj Kapur needs no introduction as everyone is aware of his films and the characters played by him. It may be Mr. Taneja from Jaane Bhi Do Yaaro or the title role from the most popular tele-serial Karamchand or Mussadilal from the award winning Office Office, the dangerous don in Iqbal or the nervous father of Shandaar, Kapur made every character memorable through his performance. "We take pride with our association with him and having the opportunity to present Dopehri to the theatre lovers in Dubai," added Dimple. 'Dopehri' is Pankaj Kapur and his wife Supriya Pathak Kapur's theratre production house, Theatron’s debut production. For tickets and information, please call 04 341 4777/ 04 369 2128. 'Dopehri' - The story revolves around the life of an old woman Amma Bi who’s almost living alone in a ‘laalhaveli’ in the Nawabi city of Lucknow with only two people attending to her; her servant Jumman and her husband’s friend Dr. Saxena. When one delves deeper into the play’s title, it might seem to be a misnomer as the protagonist’s life is neither warm nor sunny. However, as the play unfolds Amma Bi’s journey from loneliness to self-discovery grabs your attention so much so that you actually start considering yourself as an integral part of her life.